24 Jan Aussie Day at yours? How to host the best bangin’ Aussie day bash! Aussie Aussie Aussie! Our nations favourite day is this weekend so start preparing for a day filled with, BBQ’s, beers, backyard games and bangin’ beats! We’ll be celebrating all the things we love about our great nation with those we love the most. 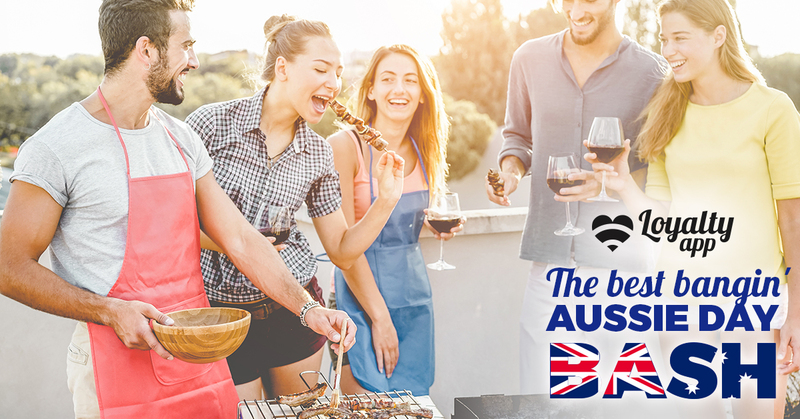 While there’s heaps of events on this Aussie Day, there’s nothing like a true blue Aussie house party to get in the patriotic spirit! If the party is around yours this weekend, then we’ve got some tips to make it the best bloody bash ever! Follow these tips and you’ll have everyone wanting Aussie Day at yours for years to come. The choice of music sets the mood for the day and no doubt you want to party. It’s essential your playlist includes the best Aussie anthems from some of our home-ground musical legends. The sounds of Shannon Noll, Paul Kelly, John Farnham, Men at Work, ACDC, Jimmy Barnes, Midnight Oil, and Kylie Minogue to name a few, should be blaring out of your speakers all day. Secretly though, we don’t think there would be anything wrong with playing Daryl Braithwaite ‘The Horses’ on repeat all day. Don’t forget to include some recent bangers as well though because we love the Biebs of course. This goes without saying. How could you call it an Aussie Day bash without the BBQ working overtime? Snags, prawns, onions, kebabs, steaks, pies and sausage rolls are all regulars at any Australian party, so of course they need to be out in full at the biggest Australian party of them all. A good feed is the backbone to any great occasion so get yourself a quality BBQ from The Outdoor Chef and cook up a top notch feast with ease. Top off the amazing main course with some other Aussie classics like; a pavlova, lamingtons, Tim Tams and a cheese platter. A stable supply of beverages for the crowd is crucial to elevating your status from party host to certified legend. To make things easier you can make your event BYO, but if you want to impress your pals with your party planning skills then providing a simple selection of Aussie beers and wines will take you to the next level. A tropical punch is always a nice addition; perfect for a warm day next to the pool and you don’t have to make it alcoholic either. Fill up your eskies with ice, stock up the fridge and get the drinks flowing. Aussie flags, fake tattoos, green and gold zinc! Need we say more. Get your house set up right and your party will be epic. You’ll reap the rewards from spending the time planning your set up to include; cool decorations, fun inflatables, Aussie flags all in a convenient layout. To save time, start preparing the party area in advance. Get tables, eskis, sun shades and any other big items laid out early so the morning of Aussie Day you’re not worrying about how it’s all going to look. Grab a heap of Aussie Day gear at IGA Willetton and receive exclusive member benefits when you use Loyalty app! Get into the Aussie spirit! Australia Day is such a great occasion that brings our wonderful country together to celebrate everything that makes this us who we are. Have fun, enjoy yourself and look after everyone around you. If Aussie Day isn’t at yours this year, we hope you have an entertaining, exciting and safe day where ever you are. Join Loyalty app and receive exclusive member deals, earn and spend Loyalty app dollars at hundreds of WA’s best brands.